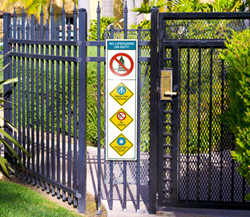 Clarion’s pool safety sign system product line includes tabletop placards, signs for front gates, signs for locker rooms, signs for use at poolside and safety cones. This sign system is a breakthrough approach that can provide an effective layer of protection at today’s aquatic facilities. As part of its ongoing partnerships in aquatic safety, Clarion Safety Systems, a leading designer and manufacturer of safety signs and safety labels, will be joining the National Drowning Prevention Alliance (NDPA) at its 16th annual educational conference, aiding the organization to save lives through drowning prevention efforts. The NDPA Educational Conference is the leading national conference devoted to drowning prevention, designed to offer attendees the best-of-the-best in research, products, educational programming, outreach strategies, policy and code. At the 2017 event, which takes place April 10 – 14, 2017 in Pittsburgh, Pennsylvania, Clarion will be a featured presenter as well as an exhibitor, showcasing the power of effective pool safety sign systems and providing resources on its “systems” approach to pool safety – proven to help increase understanding and awareness of safety messages. At the presentation session, safety signage expert and Director of Facility Safety Products at Clarion, Derek Eversdyke, will speak about “Expert Sign Systems to Prevent Drowning.” He has worked with aquatic safety customers, as well as well-known industry advocates, since Clarion launched its innovative pool safety sign system product line in 2012. He’ll be joined by Tom Griffiths, founder of the Aquatic Safety Research Group – a renowned aquatic safety expert and co-developer of Clarion’s sign systems – as well as Todd Roth, aquatics supervisor at Centre Region Parks and Recreation. “At Clarion, our passion is keeping people safe from harm. We do that by focusing on using today’s best communication technology to make the world a safer place – whether it’s through product safety labels, facility safety signs, or in this case, pool safety signs,” says Eversdyke. Clarion’s pool safety sign system product line includes tabletop placards, signs for front gates, signs for locker rooms, signs for use at poolside and safety cones. These products use state-of-the-art graphical symbols, color, language and special formatting to communicate the most serious water safety hazards. After developing its sign system using internationally-formatted graphical symbols, Clarion put its effectiveness at conveying the intended messages to the test. Testing was designed by a third-party, Applied Safety and Ergonomics, Inc., a globally-respected group of human factors experts, and conducted by the NDPA. The results confirm that the graphical symbols, text and design philosophy in Clarion signs enable quick and effective understanding of the most important pool safety messages. Clarion will also be supporting the conference by donating a full “No Lifeguard on Duty” pool safety sign system (for unguarded pools) to the event’s silent auction. Proceeds go toward supporting local drowning prevention efforts, as well as providing scholarships for students to attend the conference. For more information on Clarion’s pool safety sign system, visit its website or call 877-748-0244. Clarion pool safety sign systems are available for purchase directly from Clarion’s online pool safety catalog, as well as from leading commercial pool suppliers, including Recreonics, Lincoln Equipment, and Water Safety Products. Signs are offered in English, Spanish, and bilingual English/Spanish. They are customizable in over 30 different languages and in various sizes and finishes to meet location and climate-based considerations. Additional information on pool safety and the importance of effective pool safety signage is available on the Clarion website. The National Drowning Prevention Alliance is a 501(c) 3 non-profit organization created to form a catalyst for drowning prevention on a national scale. The NDPA is comprised of members, supporters, partner organizations, foundations and advocates that work towards increasing awareness of drowning prevention and water safety through collaboration. The NDPA believes that UNITED, we can prevent the tragedy of drowning and that together we make a difference in water safety in the United States and internationally. The NDPA is located at 1 Hall of Fame Drive, Fort Lauderdale, FL 33316 and online at http://www.ndpa.org. Comprehension Testing Fact SheetClarion's pool safety signs have been comprehension tested, confirming that key symbols and signs are quickly recognized and clearly understood. Clarion Pool Safety Sign System Fact SheetGet to know the Clarion pool safety sign system - and how to build your system.